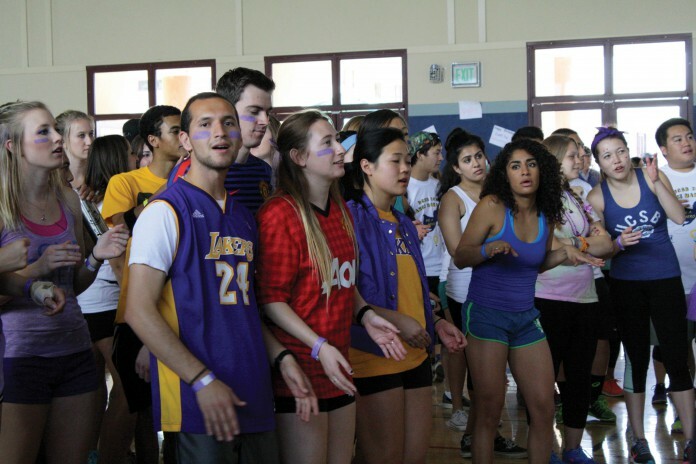 On Saturday, Feb. 28, students gathered at Pavilion Gymnasium to participate in UCSB’s second annual Dance Marathon. The event was put on by Dance Marathon UCSB, an organization within the Office of Student Life (OSL), with the purpose of donating all ticket revenues to Cottage Children’s Hospital in Goleta. Each participant’s responsibility was simple: stay in Pavilion Gym for 12 hours, from noon-12 AM, staying on your feet the entire time. Inside the gym was a main stage, complete with a DJ set up and a projection screen where colorful psychedelic shapes were shown, adding some fun visuals to the dance music. Facing the stage on the opposite side of the room was an arch of gold letter balloons spelling out the phrase “Be A Hero,” this year’s slogan, supported by two balloon pillars. Lining the sides of the expansive space were a variety of booths for different causes, including Life of the Party; Plastic Solutions, an organization devoted to ending the use of single use plastics at UCSB; KIND Healthy Snacks; and of course Cottage Children’s Hospital. Everyone was dressed in exercise clothes in anticipation of the sweating and exertion to come. Earning attendance at Dance Marathon was a challenge. For a team of 10 people or less to participate, the group had to raise $200 for Cottage Hospital. Teams of 11-20 needed $400, and teams of 21-30 needed $600. Last year, Dance Marathon raised about $13,000 dollars with 100 people. This year, the event raised $35,471.11 with about 600 participants, almost triple the previous year’s amount. In between lip syncing competitions and performances by student a capella groups like Vocal Motion and Intervals, some of the children receiving treatment at Cottage Hospital took the stage. The kids at the event were dubbed Miracle Children, paying tribute to the incredible ordeal they have had to overcome at such a young age. In various moments throughout the event, Miracle Children took to the main stage and showed off their talent by singing and dancing for the cheering crowd. Dance Marathon was purposefully family friendly to accommodate the Miracle Children and let them play with the big kids without any inappropriate Isla Vista madness. For most of the day, people did not dance as much as socialize and play, opting for athletic activities like catch and jumping through a moving hula hoop. The simple games complemented the childlike, fun nature of Dance Marathon and helped make the event comfortable for all age groups. After dinner, the childlike activities ceased and the dance part of Dance Marathon began, with student DJs providing the music late into the night.